In 2010, there were approximately 74,000 crashes reported to Public Safety. Of those crashes, there were 411 deaths on Minnesota road, 8 in Crow Wing County. The most common factors in 2010 crashes are: driver inattention/distraction, failure to yield right-of-way, illegal/unsafe speed, and impaired driving. 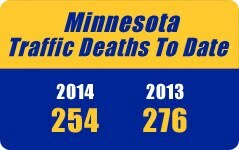 Preventing the number of traffic crashes in Minnesota each year remains a challenge for public safety officials. It is known the best way to promote safe driving is through education. Search our site, educate yourself, and spread the word to educate others. Driving is a PRIVILEGE; aggressive driving is not. Buckle up. Drive at safe speeds. Put away the phone and other distractions. Pay attention and NEVER drive impaired. "...The coalition has always placed a high priority on passenger safety. The young passengers in vehicles were the main reason this coalition was formed. As the coalition developed that focus expanded into other equally important areas and with it new partners came on board. The coalition has partnered with law enforcement, local and state highway departments, private partners, school districts, health care, and other local groups in a problem solving manner that includes ideas and solutions from these disciplines. Recognizing that the issues and dangers on the roadways do NOT fall upon just one group, the coalition is intent on proactively including all stakeholders in working towards the overall goal of ....ZERO DEATHS."